Payday to me means one thing. Shopping. I didn’t have a lot of money spare for a big spree, so I opted for Primark in the hope I would find some hidden treasures. Primark is one of those things that is hit or miss for me. I can go in week after week and not see anything that takes my fancy, or I can go in and fill a basket with goodies. It annoys me how they seem to have gone very ‘high street’ copying all the trends very badly. Primark used to be a place where I could pick up things nowhere else had, but now the clothes are on anybody and everybody. Today I had mixed feelings. I went in after a dress I’ve seen a few people wear. A gorgeous maroon jersey long sleeved skater dress. Could I find it? No, I could not. I did however spy it in taupe and navy, and I toyed with the idea of buying these, but decided against them as they weren’t the ones I wanted. I did purchase a few things, and was pleasantly surprised at how lovely they were. 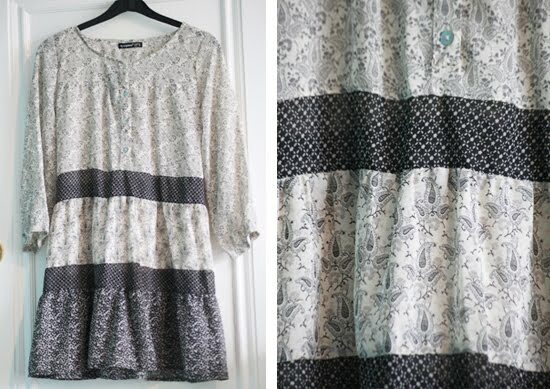 First of all I picked this chiffon smock style dress for £10. (Another annoyance – the prices are now near enough the same as any other shop…) This is lovely on, and a gorgeous mix of prints. It is very sheer, so ideally would be worn over a cami and tights or leggings for an Autumnal look teamed with lace up boots and a big cardigan. I’ll be holding onto this for a while, as it would be a great bikini cover up for holidays next summer! The only thing I don’t like about it, is it has a tie fastening at the back to cinch the waist in. I don’t think this kind of dress looks right cinched in. I see it as an Alexa Chung – esque smock, all baggy and slouchy. I’ll snip the ties off it and wear it loose i think! 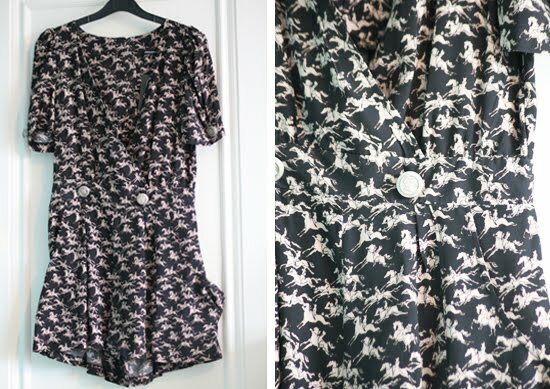 Next up is this lovely horse print playsuit. As soon as I saw this on the rail I knew it would be lovely on, and I was right. The print is beautiful, with pinky taupe horses on a black background, with quirky chess piece buttons. I plan to wear this with some black opaque tights (also picked some of those up, 3 pairs for £2.50) and brogues. This was £13, so again quite steep for Primark, but this is another item that will see me through all of the seasons. 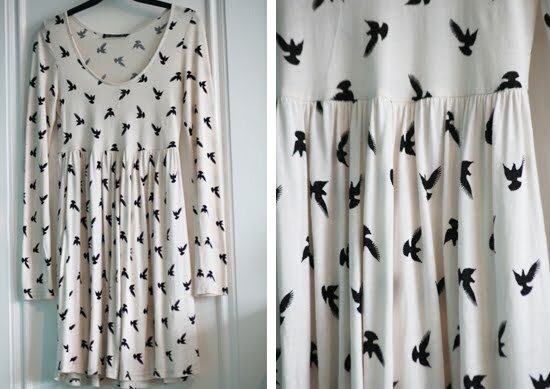 Finally I got this cute little swallow print jersey dress. I saw it all on its own and fell for it. It was supposed to be £9 (come on Primark, two years ago this would have been a mere few pounds! ), however the thread was all unravelled around the neckline. Since it was the last one, the lady at the till gave it to me for a more reasonable £5. The stitching is easily mendable, so I can’t really grumble I guess. I plan on teaming this again with some opaque tights and boots and maybe a denim jacket or blazer with a chunky knit scarf. PS. Some more photos of my work will be up tomorrow. If you like Alice In Wonderland, keep your eyes peeled! Couldn't agree more about Primark, having said that though I do find myself steering clear of it. My friend has that playsuit though and I love it, I've not actually seen it on many people which makes a change! So the Primark spree was a hit!! Maybe I'll turn my snobbish views around and have a peek next time I'm near! Lovely buys Claire. Very well done indeed! I was dying to go on a spree, too, but have decided to save up for Zara.